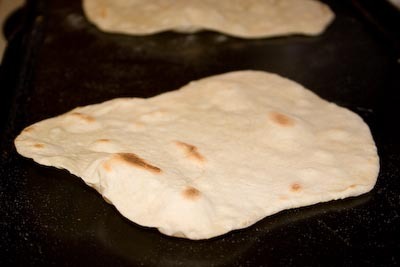 Kirk and I had fun making flat bread tonight – which if one thinks a bit about it, well it is making flour tortillas! 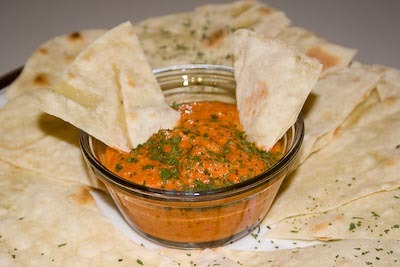 To go along with it I made up a batch of roasted red bell pepper hummus to spread/dip with the flat bread. 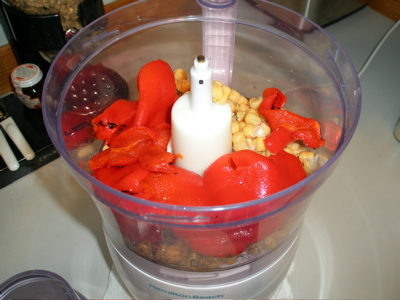 1 12-ounce jar roasted red bell pepper, drained and any seeds removed. 1 19-ounce can of garbanzo beans (chickpeas), drained and rinsed. 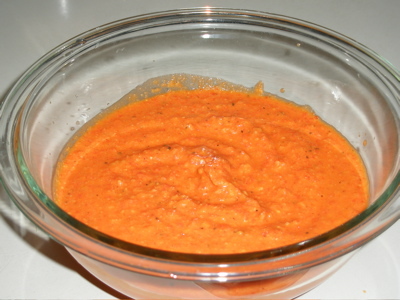 In your food processor or blender combine all the ingredinets and whirl till well blended and the texture you prefer. I like my hummus to be more of a dip, if you want a thicker hummus, cut the juice back or tightly press the bell pepper pieces to remove water. I let the hummus sit in the refrigerator for a couple hours for the flavors to blend. Meanwhile we got busy on making flat bread! In your food processor combine the flour and salt. With the processor on low, drizzle in the olive oil, then let the processor run for 10 seconds to blend. You may need to put your palm over the top if it is kicking up a flour cloud. With the processor running, slowly add in the water through the top. 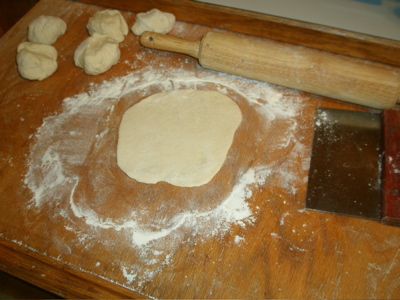 Continue processing until the dough comes together and forms a ball. You may need to add 1 to 2 Tbsp more water depending on your flour and humidity. Continue processing for another 30 seconds to knead the dough. The dough will look like bread dough. Heat an electric grill (skillet) at 350*. One at a time, place a flat bread on the grill. 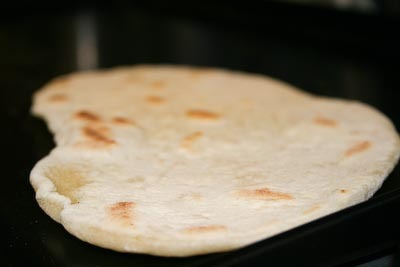 Once the bottom is lightly browned in spots and the bread begins to form bubbles, use a thin spatula to flip the flat bread. Cook for the other side till also getting nice brown spots. Repeat till done! As for how long it takes per side? 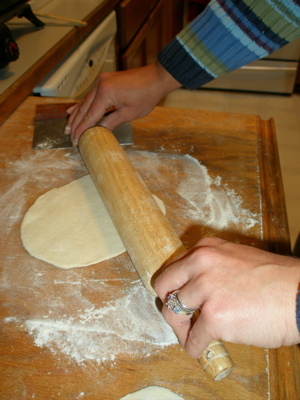 Well, it depends on how thin your dough pieces are and even the humidity will play in. Best eaten when hot – they tend to get cracker like as they cool. The hummus garnished with cilantro and served with flat bread.